November 27: A day that will forever ring out in infamy. (And not because it’s the day Tiger Woods smashed his Escalade into a tree, kick-starting the biggest sports cheating scandal since Shoeless Joe Jackson fixed the World Series in 1919.) November 27 is the day we were all reminded (again) that David Hasselhoff is a mere mortal. “He’s standing up, but he keeps falling back down,” Hasselhoff’s daughter Hayley, 17, told a 911 operator the day after Thanksgiving. “He got back up, and he’s fine. It’s kind of scaring me,” she continued. It’s kind of scaring us too, especially since it’s just the latest in a long and admittedly fascinating history of Hasselhoff Hijinks. ‘Baywatch’ was canceled just a year earlier, so maybe that’s why Hasselhoff was down in the dumps. Whatever the case, the legend reportedly showed up without luggage at a Palm Springs hotel and attacked his mini-bar. Tabloids reported he was found sprawled unconscious next to the empty fridge. Paramedics revived him, and he checked into the Betty Ford Clinic for treatment. 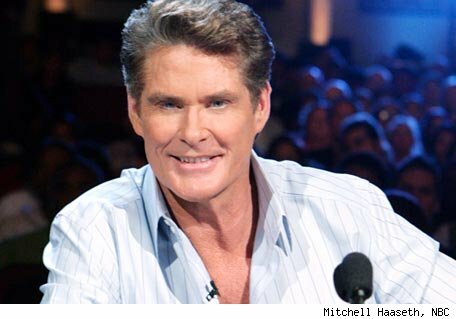 Hasselhoff reportedly hit his head on a chandelier while shaving in a gym bathroom at the Sanderson Hotel in London. He spent a night in the hospital for treatment on a severed tendon. Does this freak accident seem extremely suspicious to anyone else? If you were David Hasselhoff, you’d probably hate the Internet. Everything was going so well for the man prior to its advent. He drove a talking car, he toppled the Berlin Wall and he made an estimated $100 million before he lost a single hair on his head. After the Internet came along, his hamburger video was posted all over the universe, and everything’s been kind of downhill from here. According to RadarOnline.com, Hasselhoff’s daughter Hayley found the 56-year-old actor passed out and “foaming at the mouth, a sign of alcohol poisoning.” The Hoff was hauled off to the hospital where it was discovered his blood-alcohol content was an astounding .39, four times the legal limit. September 2009 – Drunk or Just Dramatic? Though The Hoff’s reps deny it, various news sources reported the star was hospitalized in September for alcohol related issues following a 911 phone call made by one of ex-wife Pamela Bach’s friends. Daughter Hayley again handled damage control, calling 911 herself and telling the dispatcher, “Turn around … we’re completely fine… My mom is trying to cause something … nothing happened here at all.” According to TMZ, paramedics showed up anyway and hauled the Hoff to the hospital. Hasselhoff had reportedly been partying like a wild man the whole weekend in celebration of Simon Cowell’s birthday. He had to be escorted out of the London party, witnesses told The Sun, after he got a bit unruly. Things got even more rowdy later on as the Hoff allegedly “wet his hotel bed – ruining two mattresses” and walloped an attending physician.